We work in partnership with schools in order to better connect children and young people to the opportunities we offer, from taking part in performances to working with professional artists. We also support teachers to develop their own professional dance practice. We assist teachers to deliver high quality dance provision in their schools by providing training and support. Training is offered through both the Centre for Advanced Training programme and wider work with children and young people. We aim to support teachers to enhance the delivery of curriculum work in schools and enable them to develop their professional practice, better connecting teachers to the broader dance sector and dance professionals. We have developed resource packs aimed at teachers, practitioners and community group leaders to support teaching and delivery of creative dance practice. We work in partnership with local dance organisations and practitioners across the region to support work in schools. We have produced resource packs to support the teaching of dance in schools and community settings. Developed with Liz Clark and Oksana Tyminska of Turned On Its Head, the Early Years pack is currently available for sale. 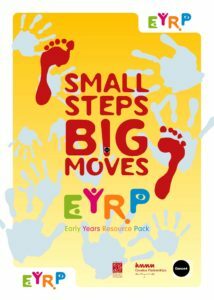 Our early years resource pack provides practitioners, teachers, artists and parents the skills and confidence to deliver dance to children. We have sold over 1000 copies of the resource, regionally and nationally, and delivered many workshops on the subject, which supports those wanting to use the pack. The ideas in the pack aim to engage the child’s natural curiosity allowing them to explore, express themselves and reflect on their world and experiences. The full Small Steps, Big Moves, Giant Leaps pack and CD is priced at £35 (plus postage and packaging). Additional copies of the CD are £10 each. To order your copy please call 0115 924 2016 or email Dance4.